Massimo's has been getting a lot of press lately. 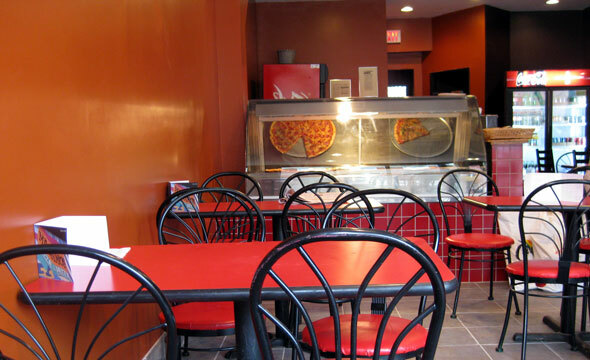 First, there was the whole sanitation and rats issue that forced the popular late night pizzeria to close temporarily. And then there was a large fire that effectively closed the place for good. But then last month we received word that co-owner Tony DeBartolo mas moving Massimo's south - to Queen and Dovercourt - and rechristening it Vinny Massimo's Pizza & Pasta. After a few weeks of renovations it's now open and once again serving the hot slices that made the original location famous. The new location is bare bones, channeling classic take-out minimalism and a certain je ne sais I don't give a f*** . I can appreciate the sentiment: pizza is one of those dishes that, if made well, requires no adornment. The slices in the takeout display certainly look good when I arrive, so I order a piece of margherita, plus a tiramisu and an Italian salad. With its thin crust, snapping-crisp edges and brown-baked cheese top, my slice puts on a good show, promising flavour and texture tasty enough to put an end to the neighbourhood's skinny jeans phase. But, like a girl with Spanx under her pants, my pizza is hiding a secret: it's old. Sweet tomatoey sauce, thin crust and delectable clusters of parsley oil all indicate that this was once a masterfully crafted pie, but too much chew and un-stretchy cheese also tell a tale of display-case neglect. Even stale, the pizza is pretty good: I just lament that I didn't get to it earlier, when I'm sure it would've been sublime. Too bad I can't say the same about the tiramisu, which is dominated by two distinct flavours: espresso and refrigerator. 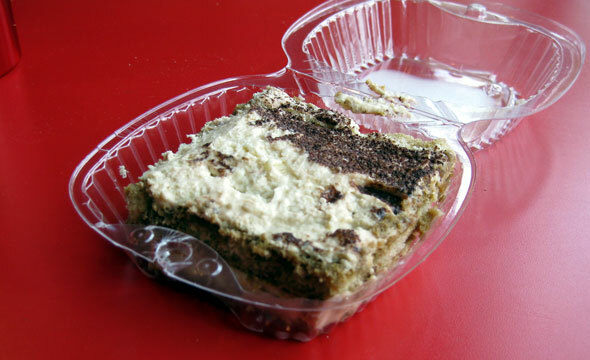 Unlike my pizza, which tastes like it's been sitting around for hours, the tiramisu seems to have been stagnating for days. Lucky I have a crisp, fresh Italian salad to chase it down (yes, I ate my dessert first). 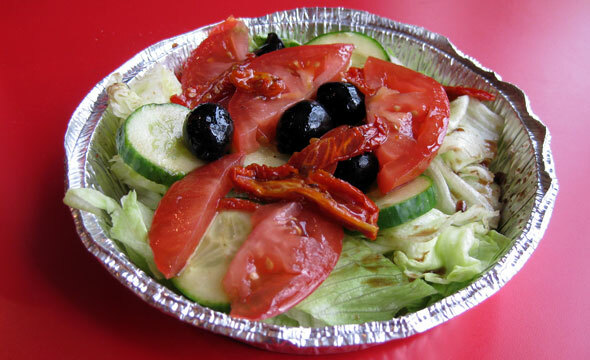 The thing about the salad is that it too is misrepresented: instead of the advertised artichokes, one of my favourite toppings, it's covered in black olives. Vinny Massimo's is pretty small, and I could actually hear how this happened. It went something along the lines of Hey, do you know where the artichokes are? followed by a No, just put olives on it . Now, in this era of rampant allergies, not to mention food preferences and consistency standards, substituting explicitly listed ingredients without customer consent is just not cool. Torontonians are pretty sophisticated when it comes to pizza, and Massimo's delivers enough flavour to show me that once again it could emerge to be among our city's top pizzerias. But if Massimo's is going to impress me, they're going to have to step up their game. I hope they will take advantage of this fresh start to clean up their act and concentrate on delivering what they clearly know how to make: super-tasty pizza pies.